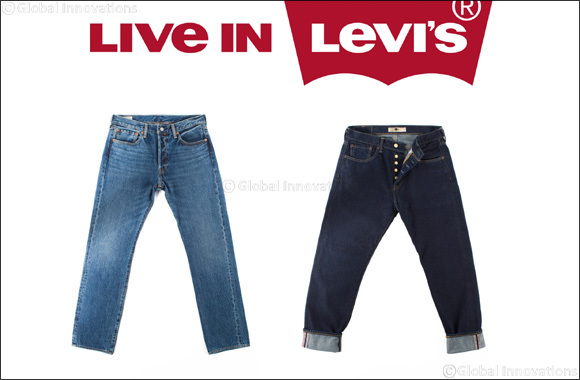 Qatar, May 20, 2018: On May 20th, the Levi’s® 501® jean, the original button fly jean, will celebrate its 145th birthday. We like to call this ‘501® Day’ and to mark this occasion, we’ve created special 501® capsules to celebrate the iconic style. The celebratory product includes limited edition 501® jeans with pops of gold and colorful buttons. 145 years is no small birthday, so we are looking back to our history to inspire this special, capsule collection. Tops feature fun archival graphics, with “Button Your Fly!” loudly emblazoned across the chest in retro throwback colors, celebrating our invention of the button fly jean. “Wow, 145 years. I feel like we have to say that number and pause to reflect on it a little. There are very few products in the history of our human species, certainly in clothing, that have anything like that type or duration. Looking at it through an anthropological lens, the 501® is something that I’m completely in awe of. I don’t think there’s been anything as well-used and tested or one that has made such a cultural impact. It’s pretty incredible. In May, we're celebrating 501® Day (May 20th 1873 was the date of our patent for the riveted pocket if you're nerdy like me) and we have a few very special 501®'s dropping into stores. There's a limited edition selvedge 501® - it's got 'talking selvedge' which is selvedge with Levi's® 501® written into it and golden buttons. There's an interesting story behind the buttons - we recently discovered a pair of deadstock 1947 501's, meaning that they've never been worn. Any denim aficionado will recognize the 47's as 'grail jeans' and to find a pair in headstock condition is unbelievable! Anyway, the buttons on this special pair had oxidized to a gold color - so we replicated the golden hue for this limited editions. There's two other special 'birthday 501® 's'. One set is being issued with multi-color 'ice cream-colored' fly buttons. And the last set has red buttons with 501® written in white down the fly for men. 145 years. Amazing. Happy Birthday 501,” says Jonathan Cheung, Levi’s® Head of Design. Everyone who has worn Levi’s® 501® original jeans contributed to their ever-changing story, and this season brings a first: exclusive gold-plated buttons and Levi’s® proprietary selvedge. Why gold? Nostalgia is at the heart of this limited-edition capsule. The 501® was originally designed as long-lasting workwear pants for miners during the gold rush in the mid-19th century and this capsule celebrates the memory of the past by launching this homage to the original wearers of 1873. Fast forward 145 years and the 501® has transformed into a fashion icon and mainstay of popular culture; the limited edition gold-plated buttoned 501® gets a sartorial twist to their humble beginnings. Make the Button Fly, Fly again! From artists to designers, rockers to pioneers, youth-culture activists to luxury streetwear trend setters, Levi’s® 501® jeans are a year-round go-to staple. The coveted 501® family of fits gets a summer edition with pastel colored buttons. Taking the celebratory design one step further, select men’s 501® jeans will also be available with buttons spelling out 501® in the iconic Levi’s® red. The oversized 100% cotton jersey tees showcase the iconic graphic that was featured in the Levi’s® “Button your Fly” campaign back in the early 90’s. The unisex tees are printed with the throwback text asking wearers to button their fly; this design comes in faded gray, white and black which is the perfect color palettes to wear with your favorite 501® jeans. A limited-edition t-shirt with the instantly recognizable signature 501® stamp in gold, inspired in similar vein to the gold buttoned 501® jeans, couldn’t be easier to style. This super-soft 100% cotton classic crewneck comes in a weathered blue.